Dale, Ronald J.. "Fort Wellington National Historic Site of Canada". The Canadian Encyclopedia, 24 May 2018, Historica Canada. https://www.thecanadianencyclopedia.ca/en/article/fort-wellington-national-historic-site-of-canada. Accessed 26 April 2019. Fort Wellington National Historic Site, designated in 1920, was one of the first HISTORIC SITES in Canada to receive national recognition of its historical importance. The first Fort Wellington was built by the British at PRESCOTT, Ont, on the north bank of the St Lawrence River. Fort Wellington National Historic Site, designated in 1920, was one of the first HISTORIC SITES in Canada to receive national recognition of its historical importance. The first Fort Wellington was built by the British at PRESCOTT, Ont, on the north bank of the St Lawrence River. It was constructed in 1814, during the WAR OF 1812, to protect a vulnerable transhipment point at the head of a treacherous set of rapids on the river. The second fort, built because of the REBELLIONS OF 1837, consisted of a new blockhouse and other buildings built inside the reconditioned earthen ramparts of the first fort. In 1923, the administration of Fort Wellington became the responsibility of the Department of the Interior, the forerunner of Parks Canada. The fort was opened as a historic park and Walter Webb, a First World War veteran, was the superintendent of the site for almost 4 decades. Today the large stone blockhouse, officers' quarters and other structures within the historic earthworks are restored to their mid-1840s appearance. Staff in period costume offer insights into life at Fort Wellington and perform demonstrations of period weapons and activities to bring the site alive. A visitor centre adjacent to the fort contains the wreck of a 19th-century gunboat, typical of the ones that would have been docked at Prescott during the War of 1812. 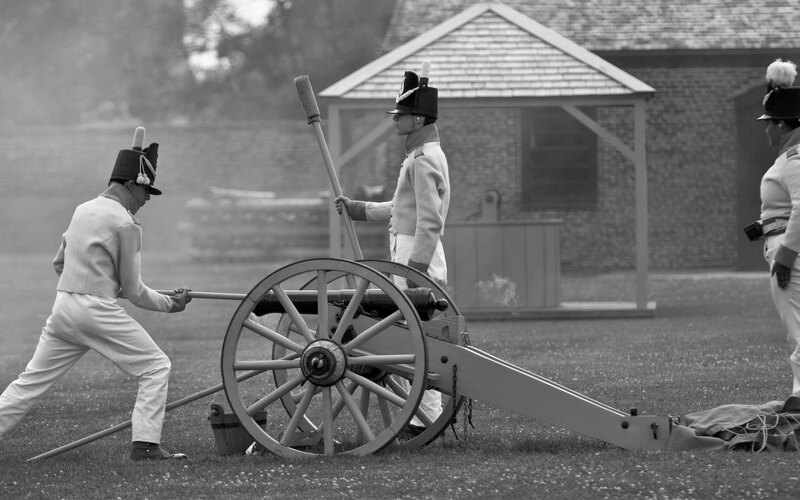 At the beginning of the War of 1812, Prescott militiamen fortified a stone schoolmaster's house and constructed an artillery battery on the banks of the river, recycling an old French gun retrieved from the ruins of nearby Fort de Lévis. By midsummer, a British army regular garrison had arrived and British gunboats were based at the Prescott dock. Across the river, a force of the 1st Rifle Regiment under Captain Benjamin Forsyth and New York militia under Brigadier-General Jacob Brown arrived in Ogdensburg, New York. Forsyth used the fortification they built as a base for several raids against British commerce in the THOUSAND ISLANDS. To counter this, British Colonel Lethbridge led an unsuccessful amphibious attack on Ogdensburg from Prescott on 3 October 1812. On 22 February 1813, a more successful raid on Ogdensburg was launched. 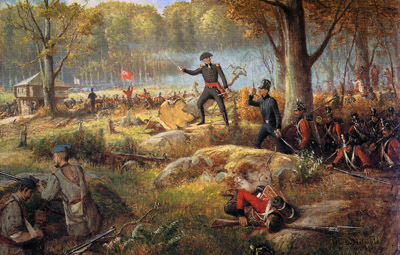 A force of regulars and militia under the command of Major "Red" George MacDonnell crossed the frozen St Lawrence to capture the American town. The British became concerned over the vulnerability of Prescott and recognized the precarious nature of the British supply system. 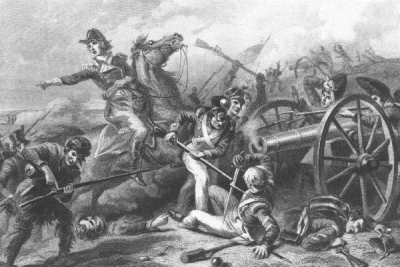 Consequently, British commander-in-chief General George PREVOST ordered a strong fortified post with a heavily armed artillery battery to be erected. Construction began in May 1813. The fort featured earthen ramparts surrounding a massive one-storey blockhouse and was named to honour the Duke of Wellington. Though it was still under construction at the time of the BATTLE OF CRYSLER'S FARM, its newly installed artillery played a role in delaying the American army. By the time Fort Wellington was completed in late 1814, the war was almost over. Fort Wellington continued to be occupied by a British army garrison after the war but little was put into maintaining the log and earthen structures. The development of more peaceful relationships with the United States and the construction of the RIDEAU CANAL as an alternative supply route made the fort redundant. The fort was finally abandoned in 1833 and allowed to decay into ruins. A second fort was constructed by the British in 1838-39 during the rebellion in UPPER CANADA as a gathering place for militia and as a strongpoint for the defence of the border. The fort was not completed until the hostilities were over, but the Prescott garrison did fight the BATTLE OF WINDMILL, defeating a rebel invasion. The British army occupied the fort until 1854 and again in 1866 but finally abandoned it in 1869. It then became a storage depot for the local militia. Gilbert Collins, Guidebook to the Historic Sites of the War of 1812 (1998, revised 2006); Ronald J. Dale, The Invasion of Canada: Battles of the War of 1812 (2001).